Our clowns are the most kid friendly actors in business. 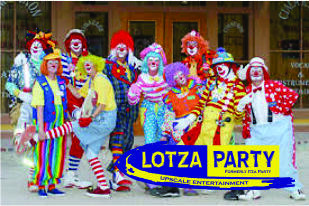 Lotza Party's reputation for providing the best entertainment is apparent with our clowns. Male and female clowns are always available. Our clowns will interact with your party guests as well as play games and hand out small prizes. This is a great surprise gift for grandparents to provide something special at their grandkids birthday party.